Issue 11 (Sep - Oct 2003): This issue it's MONSTERS! So get ready to visit Frankensteins Monster, the Creature, and more. 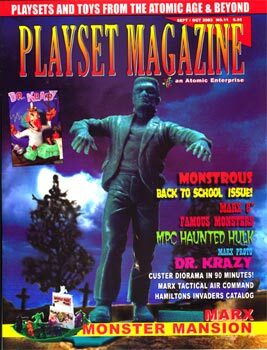 Horrible Hamilton / Hamiltons Invaders catalog pages, a special AIP preview of the Arabs, PM Puzzler, MPC's Haunted Hulk, Marx TAC set plus the Build your own Diorama in 90 Minutes feature. PM Delivers Monsters this month!